This easy strawberry mandarin orange dump cake is the perfect spring dessert! It’s bright, fruity, and just so simple to make. 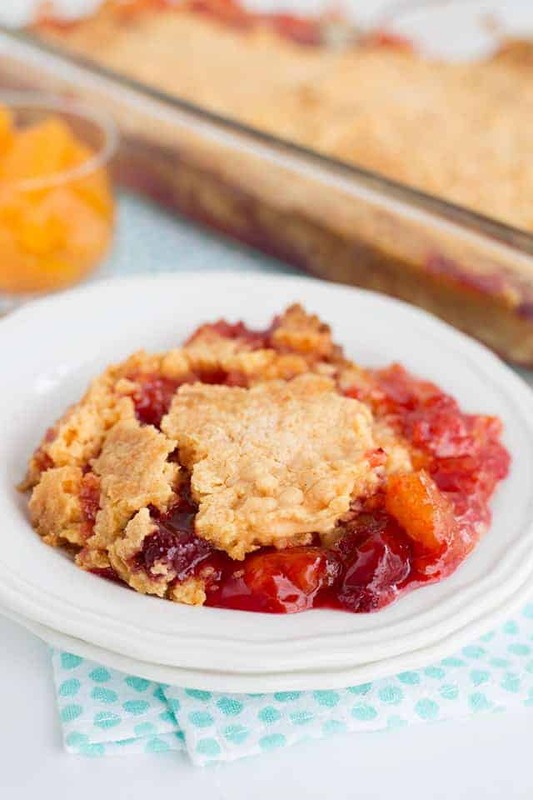 Grab some strawberry pie filling, a couple of jars of mandarin oranges and get baking! If you like this recipe, make sure to check out my Strawberry Shortcake Cake. 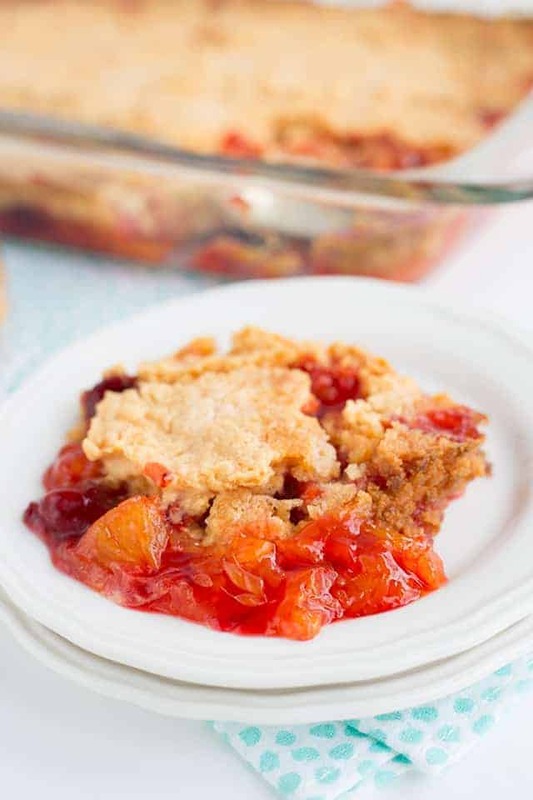 This strawberry mandarin orange dump cake is so simple to whip up. If you love strawberry and orange together, this is the dessert for you. The yellow cake mix becomes dense and buttery. The strawberry pie filling coats the mandarin oranges and makes the prettiest color. What I love about dump cakes is that you literally dump everything into a dish. Does it get any easier than that? It really can’t. Also, this cake literally only has 4 ingredients. 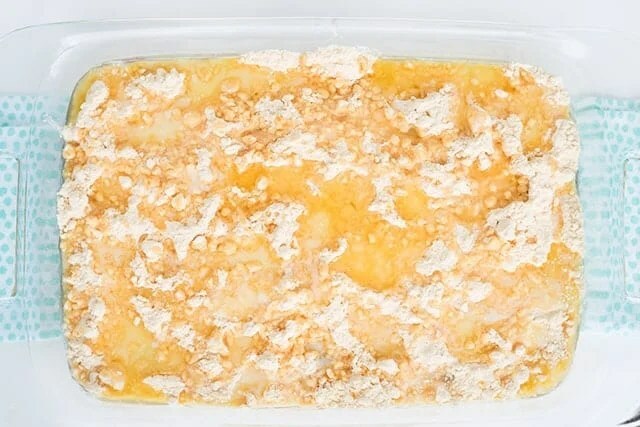 The first step to this dump cake is to thoroughly drain the mandarin oranges and add them to the bottom of a 9×13 pan. Add dollops of the strawberry pie filling on top of the mandarin oranges. Using an offset spatula, spread out the pie filling to cover the oranges. I bet you can’t guess what’s next! I sprinkled the dry cake mix on top of the strawberry pie filling. Sprinkle being the keyword. Make sure you cover all of the pie filling. Last part is to drizzle the butter all over the top of the dry cake mix. Throw it in the oven until the filling is bubbly and the top is golden brown. Mandarin Oranges – I like to buy the mandarin oranges that are in the plastic jars. The mandarin oranges in the tin cans taste off to me. 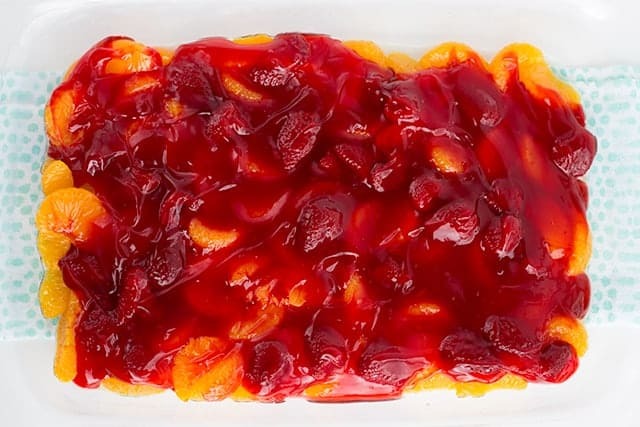 Strawberry Pie Filling – I’m a big fan of the store-bought strawberry pie filling. I don’t have a brand preference, but I did use the Lucky leaf brand for this recipe. 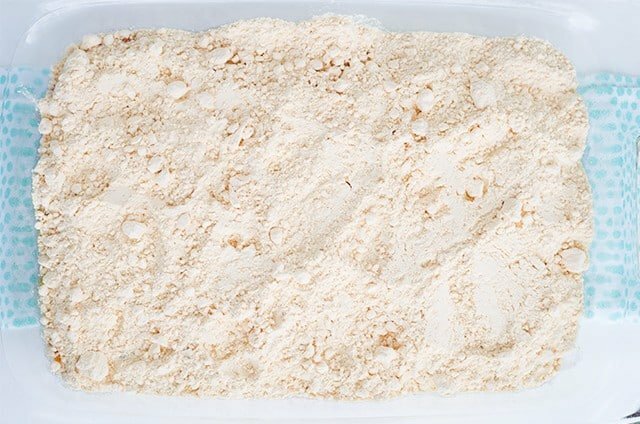 Dry Boxed Cake Mix – I’ve tried it with both a yellow cake mix and an orange cake mix. I prefer the yellow cake mix, but the orange is delicious too. It’s just harder to find. 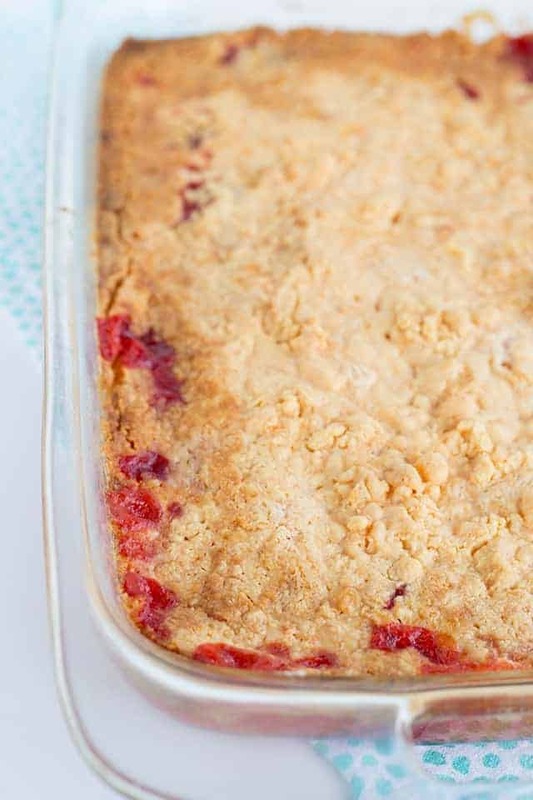 Butter – I really like to use salted butter to pour on top because it adds a hint of sweet and saltiness to the strawberry mandarin orange dump cake. Can I substitute the Strawberry Pie Filling? Yes. 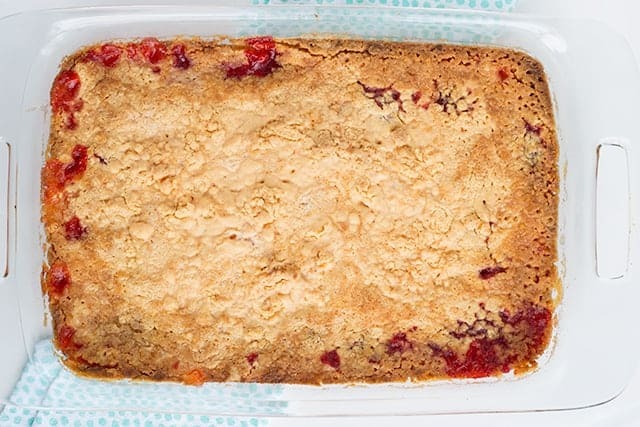 If you want to use another pie filling like cherry to make a cherry orange dump cake, do it! I’m not sure how the other pie fillings would taste with mandarin oranges, but you’re welcome to try blueberry, raspberry, blackberry, and any other flavor that I missed. As far as flavors, I would recommend either a yellow cake mix or orange cake mix. For the brand, I suppose it doesn’t really matter. I always gravitate to the Betty Crocker Super Moist cake mixes. Are they better than other ones? I don’t know. It’s just what I always grab. The orange cake mix is a Duncan Hines Supreme cake mix. 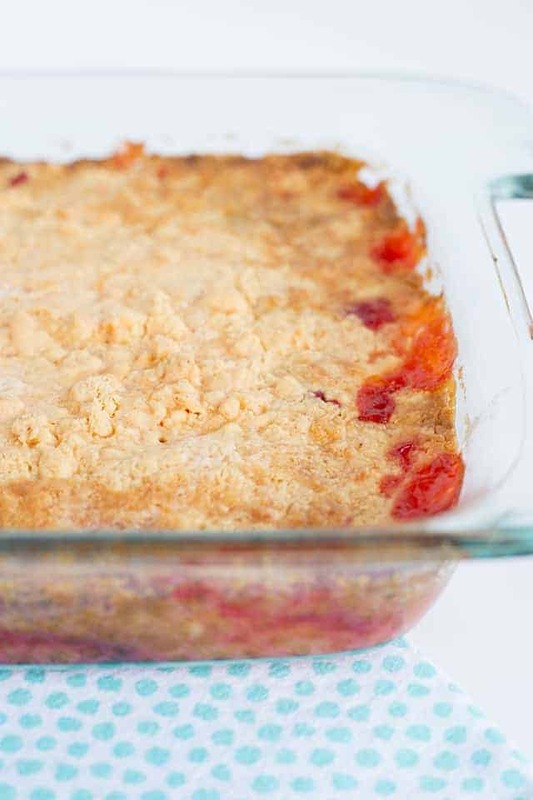 This easy strawberry mandarin orange dump cake is the perfect spring dessert! It's bright, fruity, and just so simple to make. 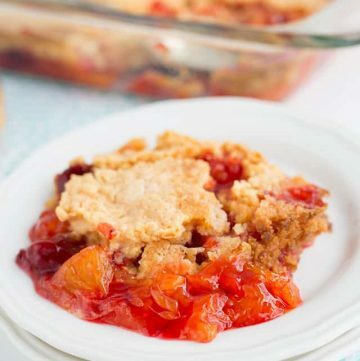 Grab some strawberry pie filling, a coups of jars of mandarin oranges and get baking! 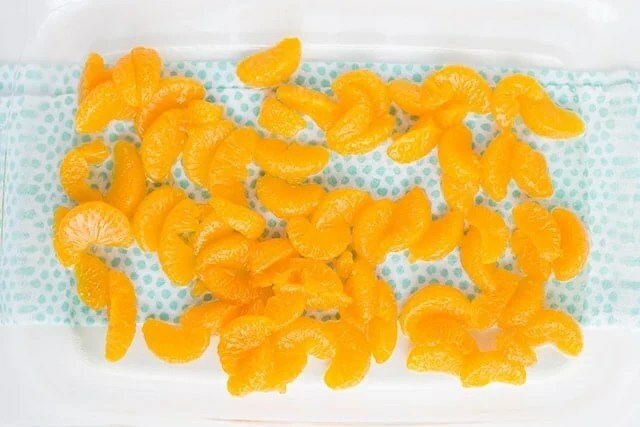 Add the drained mandarin oranges to the bottom of the pan. Spread them out. Add dollops of strawberry pie filling on top of the mandarin oranges. Spread out with an offset spatula. Evenly distribute the cake mix on top of the strawberry pie filling. Be sure to get all of the edges with cake mix too. Drizzle the melted butter on top of the cake mix. Place into the preheated oven and bake for 55 minutes until the filling is bubbly and the edges are golden brown. Let cool. Scoop and serve. LOVE this one !! These dump cakes are so easy and everyone just seems to love them. Try the mandarin oranges with peach pie filling or use canned pears with about 1/4 cup of the liquid from either the oranges or the pears (save the rest of the liquid to use in another cake – it adds much more flavor than plain water or milk). I love putting together dump cakes. So easy and everyone loves them! I use Duncan Hines Butter Golden mix and depending on the fruit, I sometimes add chopped pecans to the top before putting in the oven. I’m a huge fan of dump cake… makes me feel like I can actually bake. 😉 But I’ve never ventured out from the cherry/pineapple version. Looking forward to this one! Thanks for sharing. 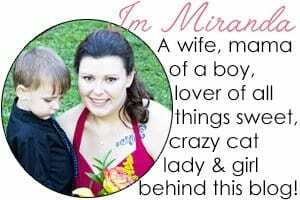 Saw this on the Happiness is Homemade link party. Pinned! Before dump cakes came into being, I remember a Butter Pecan Peach Crisp made with a 28 ounce can of sliced peaches with its syrup, a butter pecan (or spice) cake mix, sweetened flaked coconut, chopped pecans or walnuts, and melted butter. It was wonderful served warm with vanilla ice cream!